Dice the onion and saute it with the oil in a pot large enough to hold the soup. While that’s cooking, dice the carrot. When the onions look clear, add in the carrot and stir. Throw in a pinch of salt. Let those cook till soft. At this point, I also threw in some fresh thyme but I’m not sure if that added anything. Dice the mushrooms and put those in also. 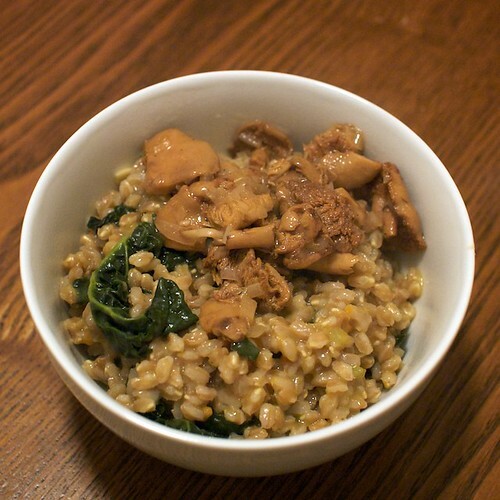 When the mushrooms are browned and soft, drain the farro and put it in the pot. Stir for a couple of minutes to toast the farro in the oil and aromatic ingredients. Next, add in the drained chickpeas. Throw in a few teaspoons of salt, and then enough water or broth to cover plus one inch. Cover the pot and let that come to a boil. When it does, turn the heat down to medium low and let it simmer with the cover on. Stir every 10 minutes to make sure it doesn’t stick to the bottom and add more water if it looks like it’s getting dry. In the meantime, make pesto out of the basil, garlic, olive oil, and a pinch of salt. I like to do it in the mortar and pestle just so I don’t have to clean the food processor and it’s the proper way to do it. There should be 2-3 tablespoons of pesto. Wash your greens and roughly chop them. After thirty minutes, check the farro and chickpeas. If they’re soft, go on to the next step. If not, cover and check back in another 10 minutes. When the farro and chickpeas are cooked, stir in the greens, some more salt and cover to cook. 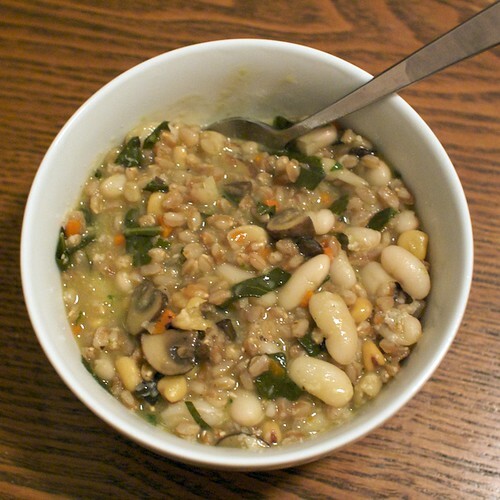 When the greens are wilted and cooked (5-10 minutes) stir in the cooked cannellini beans. If there’s still a lot of liquid in the pot, take the lid off and let it cook off. I left enough liquid so that the ‘risotto’ was still pretty creamy. When the risotto is to your preferred consistency, turn off the heat, add in the pesto and stir. Salt and pepper to taste. As a final step, you can also stir in freshly grated cheese, but I found that this step was unnecessary since the ‘risotto’ was plenty creamy. I love mushrooms and I’m ashamed to say that I didn’t know about hedgehog mushrooms sooner. I always thought that ‘hedgehog’ was just another name for morels. It wasn’t until I ordered a dish of farro risotto with hedgehog mushrooms that I realized they were completely different! Since I had that dish up in SF with my co-workers, I wanted to recreate it at home, but I was afraid that hedgehog mushrooms would be scarce in LA. Mushroom Man to the rescue! I happened to be near the Santa Monica Farmer’s market on Saturday and popped by the Mushroom Man’s booth and he had hedgehog mushrooms! At $20/lb, they’re more expensive than my usual mushroom purchases, but I couldn’t let this opportunity pass. Lucky for my wallet, I let the opportunity of buying black truffles from him pass. The first time I had risotto was when Will cooked it for me. He had been slaving for hours over the stove with his home-made broth and risotto making. I took one bite and said, “Huh, it just tastes like porridge.” The big deal of risotto didn’t really click with me. But farro risotto, I can get behind! I didn’t want to do anything too complicated with the mushrooms since I wanted their natural flavors to shine through, so I just sauteed them with some shallots and white wine. I probably went a little heavy-handed with the wine, but it still tasted pretty good. Combined with some slow-cooked dinosaur kale, and farro risotto, it made for an easy Saturday meal. Will even contributed with a simple but delicious salad of mixed greens, and sliced kumquat and fennel. Dice onions and cook them in some olive oil until translucent. I wasn’t trying to caramelize them, so I didn’t wait for them to color. In the meantime, dice the carrots and celery in roughly the same size. When the onions are translucent, put the carrots and celery in. Cook these on medium heat till tender. It’s okay if they caramelize a little. 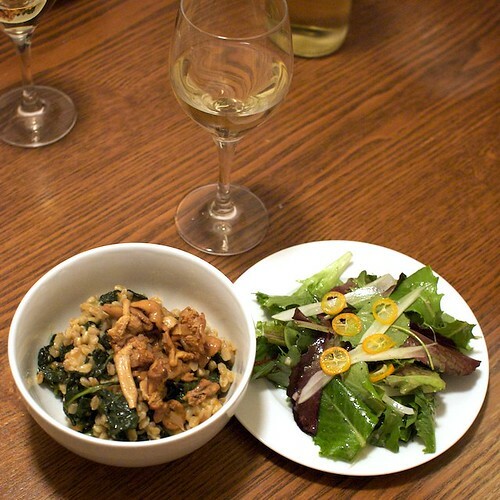 When the vegetables are tender, pour in a few more teaspoons oil, and then the farro risotto. Stir to mix. Turn the heat up to high and pour in enough broth + water mixture to barely cover. Add some salt and pepper to taste. Let that come to a boil, turn the heat down to low, throw in the thyme, and simmer with the lid on. Every 10 minutes, take the lid off, give it a stir and top off with more broth+water if it gets too dry. It should be somewhat soupy in there, but not as if the farro were all submerged in water. Cook like that until the farro’s done, adding broth+water when needed. I’m not sure how long that took since I was prepping the rest of my meal and I can never figure out how long it takes for farro to cook. I needed to give our stomachs a rest from the spicy dinner we had last night, so I made something pretty mild. 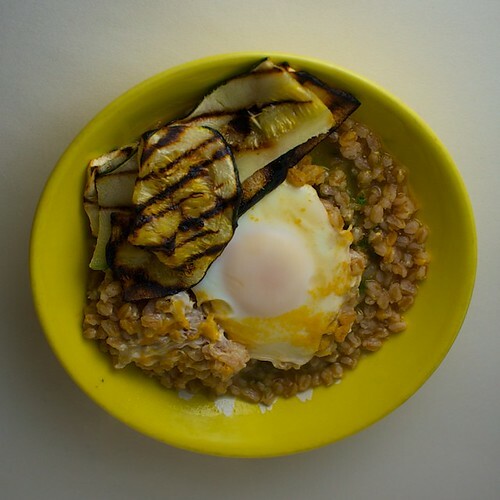 It’s something I made up to use the extra zucchini we had laying around: farro with pesto, grilled zucchini, and a poached egg. The pesto was hand-pounded by me in a mortar and pestle. I came up with it because it was about time I trimmed my basil plant. Believe it or not, this was the first time I grilled zucchini. It was on my cast iron grill pan on the stove, not on an actual open flame. It came out pretty good with just a light brushing of olive oil and some salt. That charred vegetable taste does add a lot to the veggie. Overall, this was a fairly easy to make, successful dinner. It’s plain enough that it’s good for when we want something simple and bland.